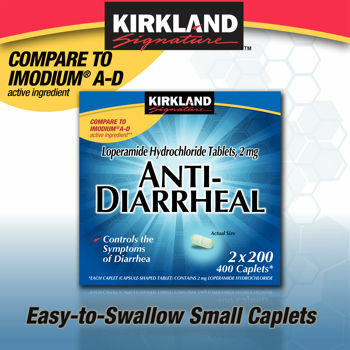 Kirkland Signature Anti-Diarrheal Loperamide Hydrochloride 2 mg 400 Caplets (2 x 200 ct) SALE! Controls symptoms of diarrhea, including Travelers' Diarrhea. Drink plenty of clear fluids to help prevent dehydration, which may accompany diarrhea. Find right dose on chart. If possible, use weight to dose; otherwise, use age. Adults and Children 12 years and over: 2 caplets after the first loose stool; 1 caplet after each subsequent loose stool; but no more than 4 caplets a day. Children 9 - 11 years (60 - 95 lbs. ): 1 caplet after the loose stool; 1/2 caplet after each subsequent loose stool; but no more than 3 caplets a day. Children 6 - 8 years (48 - 59 lbs. ): 1 caplet after the first loose stool; 1/2 caplet after each subsequent loose stool; but no more than 2 caplets a day. Children under 6 years (up to 47 lbs. ): Ask a doctor (not intended for use in children under 6 years old). Loperamide HCI 2 mg. Purpose: Anti-diarrheal. Anhydrous Lactose, Carnauba Wax, D&C Yellow No. 10, FD & C Blue No. 1, Hypromellose, Magnesium Stearate, Microcrystalline Cellulose, Polyethylene Glycol, Pregelatinized Starch. Allergy Alert: Do not use if you have ever had a rash or other allergic reaction to loperamide HCI. Do not use if you have bloody or black stool. Ask a doctor or pharmacist before use if you are taking antibiotics. Stop use and ask a doctor if diarrhea lasts for more than 2 days. If pregnant or breast-feeding, ask a health professional before use. Keep out of reach of children. In case of overdose, get medical help or contact a Poison Control Central right away. This product does not qualify for Free shipping!